My name is K.A Bolton. I live in midtown Manhattan. For several years I have been ghostwriters for a number of author. I also wrote a few short stories. I have written five books so far. 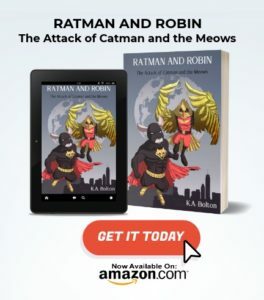 The name of my latest book is Ratman and Robin: The attack of Catman and the Meows. Well, the idea first came to me many years ago but it wasn’t until last year that I decided to put pencil to paper and piece the idea together. It was inspired by my love for comics and animals and I thought ‘wouldn’t it be cool to create a new kind of superhero’. I thought about which animals could be used as a superhero and I thought it’d be cool to use the most unexpected creatures and transform them into a superheroes. After that, the blocks just started to gather. Yes, actually I do have unusual writing habits. I just think there is something classical about writing with pencils, and there is a inherent connection between the pencil and my mind that allows the ideas to flow fluently. So when other people may use pen or a tablet, I use a pencils. Evidently I have to eventually type it out, but that doesn’t matter. It may be time consuming to have to type it after I write it, but I don’t mind going that extra mile. What us your favorite book of all time? ‘Hidden Fire’ by Sandra Brown. I think that was one of the first books I actually read, not for academic purpose, but for casual entertainment and I think this is the inception of my passion to write. There are a few. I think one of the most important ones is to never give up. Do you have any advice for new author? Yes I do. If writing is your passion, ensure to pursue it with unrelenting vigor. Always jot your ideas down, never waste an ideas or delay it for another moment. If it comes in the middle of the night, or while traveling on the bus, or even at work, the moment you get the opportunity, write it down. Also read a lot. Trust me, I can tell you, reading enhances your writing skills and is expedient in your overall cognitive ability. Well, I am working on two books currently. The third book of a trilogy and I am also writing and the second book in the series for Ratman and Robin. If someone wanted to buy Ratman and Robin, where could they buy it?